the story here is that Sporting de Gijón want to sign a Colombian centre back, Bernardo, but Premier League clubs are also sniffing around and there's no way they can compete. Not sure how exactly we'd choose to put that in sports-page English - maybe something like BERNARDO: PREMIER LEAGUE MAKES IT NO GO FOR SPORTING but in Spanish, the same idea can be conveyed as CHECKMATE TO SPORTING. Hard to translate properly, because in fact we don't usually say checkmate "to" anybody or anything. 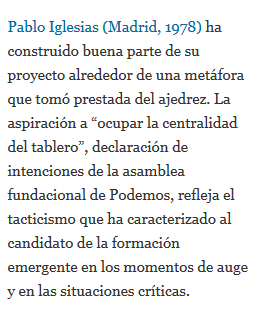 How accurately the concept occupation of the centre is being interpreted by Pablo Iglesias, or Podemos, or commentators on either, I don't know and I don't think I'll try too hard to guess. As far as I know Pablo isn't actually a chessplayer himself, although last November El País seemed to think otherwise. apeló a la mayoría social para "ocupar la centralidad del tablero" político, como en una partida de ajedrez. he called on the majority in society to "occupy the centre of the (political) chessboard", like in a game of chess. y esta es la partida contra "la casta" que pretende disputar en el tablero español. and that is the game, against the "caste", which he is hoping to contest on the chessboard of Spain. I'd have thought "occupying the centre [ground]" to be the (rather clichéd) aim of a lot of politicians, each defining it as whatever they happen to believe. That's so, but in those instances the idea is usually to move one's party to the centre ground, as opposed to produce ideas which themselves will occupy the centre. In the USA, the primary election is a struggle over the last rank. The phrase "playing 3-dimensional chess on a 2-dimensional chessboard" is used to describe politics sometimes, or more recently Trump's provocations with the USA media, the way he manipulates them. I think I saw someone muse about Obama's "nine-dimensional chess" once, when his handlers were trying to assert he was out-thinking everyone else on some global situation.